There's an old cliche that the Federal Reserve likes to take away the punch bowl just when the party is getting going. 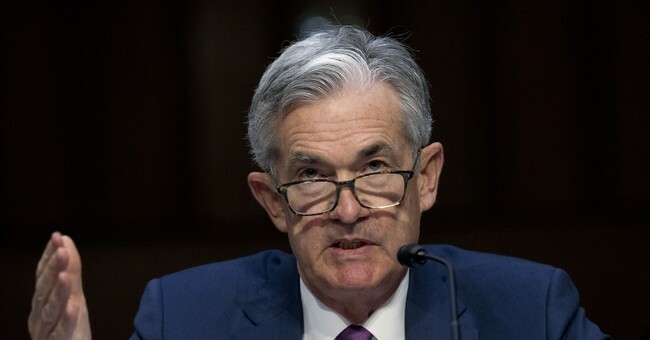 That's what President Trump suspects that Fed Chairman Jerome Powell is doing now by raising interest rates at a time of a booming economy. Last week, Trump took a shot at the Fed when he complained to Reuters that "I'm not thrilled with them raising interest rates." When asked if he believed that the Fed should be "independent," Trump said, "I believe in the Fed doing what's good for the country." In response to these comments, many in the media and on Wall Street have been suffering heart palpitations. The president is trying to bully the Fed into keeping interest rates low, they protested. Others claim that Trump is trying to politicize the Fed. Of course, we don't want the Fed's monetary decisions to be based on politics or the election cycle. But why should it be taboo for this president, who effectively serves as the nation's CEO, to weigh in on financial and monetary decisions that fundamentally affect the economic success of the nation? The Fed independently makes its own decisions on the direction of monetary policy, but seemingly every pundit in America has an opinion on what it should do. Why not the president -- especially a man who has already proven he knows more than a thing or two about business and the economy? Washington seems to treat the Fed governors as if they are mystics with magic tea leaves that tell them where the economy is headed. Sorry, these are just a bunch of economists with computers. Fed Chairman Powell was appointed last year by Trump, so it is still too early to tell how he will perform. But what we do know from recent history is that the economic sages who run the nation's monetary policy have been guilty of grotesque errors that have driven the U.S. economy into deep, deep ditches. In the 1970s, it was the brilliant economic minds at the Fed who were under the spell of the Keynesians who believed that easy money and low interest rates create jobs. (If only it were that simple and jobs could be created by revving up the printing presses.) As unemployment went higher and higher, the Fed printed more and more money, which gave us the witches brew of high inflation and high unemployment -- and a mini-depression by 1979. If the Fed is omniscient, why didn't they pull back on the excess money supply that inflated the massive housing bubble that popped so disastrously back in 2008? Despite record Fed interventions in the economy after the recession hit, we had the weakest economic recovery since the Great Depression. This is hardly a track record to be proud of. Trump believes that high growth with low interest rates and low inflation are compatible. So far he's proven that case with his pro-growth economic policies that have shifted out the supply-side capacity of the economy and increased productivity. Increases in output generally lead to lower prices, not higher prices. The Fed apparently is still stuck in the 1970s intellectual cul de sac of the Phillips Curve -- a theory that higher growth means more inflation and more inflation means higher growth and more jobs. We hear many economists peddle this discredited concept when they say that the Trump economy is "overheating," or that 4 percent growth is "unsustainable" and will lead to runaway prices. Even worse, many economists look at wage growth as an inflationary barometer rather than a favorable outcome. If that were the case, we could never get middle-income wages up, because every time worker pay rises, the Fed would have a panic attack and tighten money to drive paychecks back down again. The whole point of Trump's economic agenda is to help the middle class -- a group that hasn't seen income gains in nearly two decades. We don't want inflation, and we are certainly not arguing the sophomoric Keynesian notion that printing money creates growth. We want a stable dollar that retains its value and doesn't gyrate wildly over time. But where is this inflation monster that everyone seems to be spooked about? Consumer prices are growing at between 2 percent and 3 percent. That's hardly hyperinflation. The best measure of inflation is what is happening with commodity prices. And the CRB index of commodities suggests that we have been suffering from a slight deflation -- not inflation -- in recent years. Ask farmers if they think we have too much inflation in the economy. The prices of corn, cotton, wheat and so on have been falling, not rising. The same is true for copper and silver, and even gold. Inflation, at least for now, appears to be a bogeymen. The Fed's job is not to stall growth or to prevent economic "overheating." It is to keep prices stable and the dollar a strong and reliable currency. Rapid GDP growth and rising wages are not the enemy; they are the goal. This is what Trumponomics is all about, and if the Fed isn't with that program, then Trump is right to attack them for trying to block America's grand economic comeback.